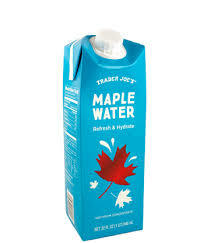 To refresh yourself during the last waning weeks of summer Trader Joe’s now has Maple Water. Made from maple tree sap before it is condensed down to maple syrup, Maple Water is not too sweet and fairly low in calories – 25 calories per cup. Thanks lots to the post. Thank you Yet again. Wonderful. Thanks for the thanks, I appreciate it!